What is the “WARN” Act? California’s Worker Adjustment and Retraining Notification Act, “WARN” for short, obligates employers of 75 or more employees to follow certain procedures when downsizing the workforce. The WARN Act does not apply to a few layoffs. 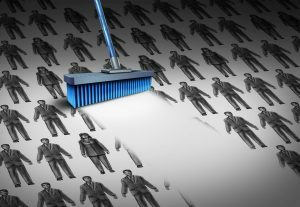 Rather, the WARN Act applies to what is known as a “mass layoff,” in which the business lays off 50 or more employees during a 30-day period. Businesses considering downsizing their workforce must be wary of the consequences of failing to comply with the WARN Act. Failure could cost the employer a significant amount of money in back pay and other compensation. Consulting with an experienced Silicon Valley Employment Lawyer at Structure Law Group, LLP will help you avoid the pitfalls associated with downsizing your workforce. Owners of “covered establishments,” that is, businesses employing 75 or more employees in a 12-month period, must give proper notice of a mass layoff. The employer must give notice to its employees 60 days in advance of the layoff order. “Layoff” means cessation of employment because of insufficient money or an insufficient amount of work. The term “layoff” does not apply to seasonal employment or employees in certain industries including logging and motion pictures. The WARN Act also applies to mass relocations and when an employer’s business closes down. To qualify for the WARN Act’s protection, an employee must be employed by the company for 6 of the preceding 12 months. The titles of the positions affected and the names of the employees who hold those positions. Failure to give appropriate notice may result the employer having to compensate the employees. This could include back pay at their regular rate of compensation and the costs of benefits an employee would have received, including medical insurance. The California WARN Act exempts employers from giving the 60 day notice in limited instances. California’s Department of Labor, who oversees WARN Act compliance, has the discretion to dispense with the notification requirements if the company was actively soliciting business or capital investments and the business or investments sought, if realized, would alleviate the need for a layoff or termination of the business’ operations. Furthermore, employers are exempt from the notice requirement if giving notice would prevent them from winning new business or receiving a capital investment. The employment lawyers at Structure Group, LLP will guide you through the downsizing process. Businesses considering downsizing are advised to seek legal counsel well in advance of implementing layoffs. Call Structure Law Group, LLP today at 408-441-7500 to schedule an appointment to discuss the legal matter concerning your business.